This picture is from Michelle Yamazaki. I was lucky enough to be a part of the 2005 DCI Honor Corps experience last winter. We all had such a great time, some of us from California decided to have our own small reunion in Disneyland in the Spring. This picture is of Kurt Kilgus (Pacific Crest baritone), Tiffany Mason (Esperanza color guard), Michelle Yamazaki (Mandarins baritone), Tracy Pomerantz (Esperanza color guard) and Erin Braxel (Esperanza trumpet). 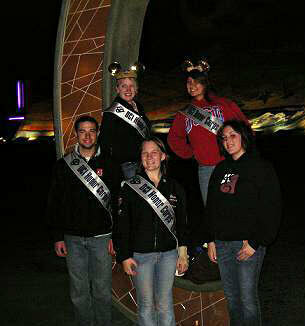 We are currently planning another reunion for this winter with a lot more people from the Honor Corps!